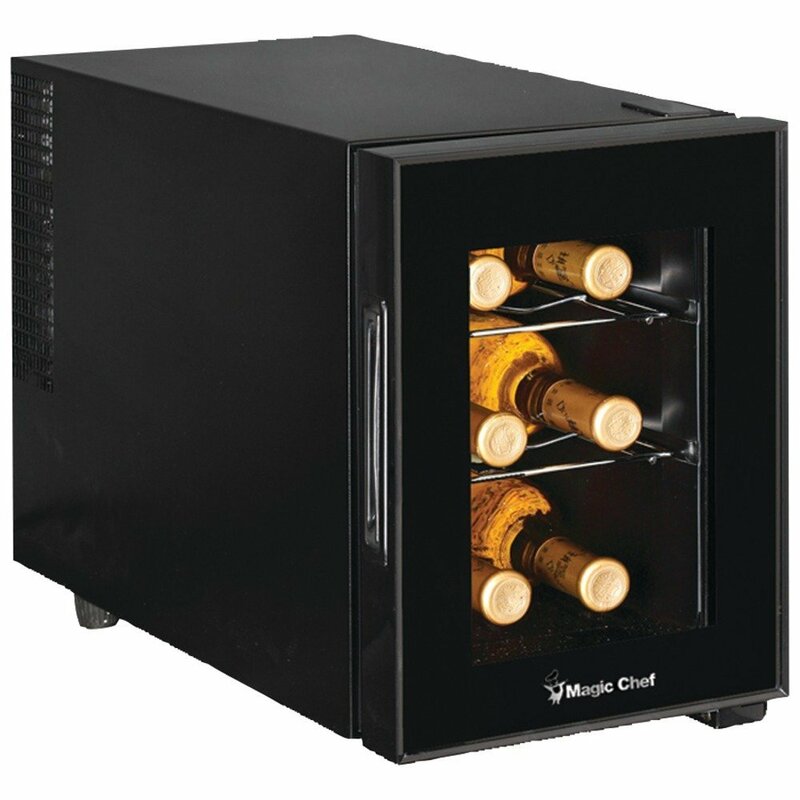 There are two different wine coolers by Magic Chef that are worth exploring. There’s a small six-bottle cooler that can be perfect for your counter plus a larger 28-bottle cooler that is better for larger and more wide-open spaces. These two options are varied based on how you can control them and where you can store them. These still have some positive features that are shared among both models as well. The Magic Chef MCWC6B is one option for you to check out. This is a six-bottle cooler that can easily be added onto your countertop. This is a small unit that is only 19.4 pounds in weight and is just 15 inches high and a little less than 11 inches wide. It can hold up to six bottles with the use of two shelves and one bottom area that you can use. The two shelves are made with chrome materials and are grooved so you don’t have to worry about the wine bottles on them shifting around. This has leveling legs that can be removed as needed. You can use these legs to keep it leveled even when you’re on an uneven surface. The thermostat on this cooler is relatively simple when compared with so many others on the market. The thermostat will allow you to adjust the cooler based on whether you have red or white wines. It takes the wine and chills it at different varying levels to ensure that the conditions within the body are comfortable and proper for the wines you’ve got. This wine cooler works best if you have a need to store only a small amount of wine. It’s also appropriate for when you’ve got a smaller space where a massive cooler would not be appropriate in. Still, you should take a look at the design features that come about with it so you’ll have something that is useful and easy to enjoy holding for when you’re looking to store just a good bit of wine as needed. The MCWC28B has a similar name to the other wine cooler from Magic Chef listed here but the big difference, as seen in its name, is that it can handle up to 28 bottles of wine at once. This is a freestanding wine cooler that is 29.1 inches in height and weighs 41.9 pounds. 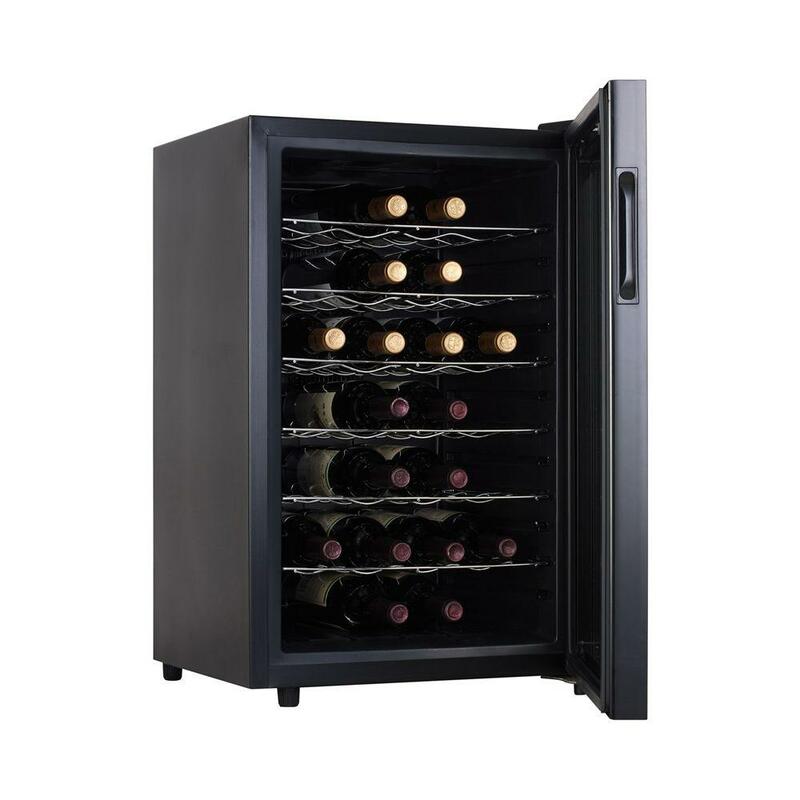 Like the six-bottle cooler, this larger one also has a black body with a sturdy glass door surface. It also has leveling legs that can be removed or changed around as needed for when you’re storing the cooler on an uneven space. It’s also designed with the same strong black body that is well-insulated and will be very easy to hold and use as required. However, one big point about this 28-bottle cooler that makes it so different comes from the temperature control system. This system is located on the top part of the door. This allows you to set a specific temperature that the cooler will work in. This means that you don’t have to stick with a generic setting when you’re trying to chill whatever you’ve got. In addition, there are six chrome shelves inside this cooler. These shelves include a series of small grooves that will give you the capability to hold four on each rack. Of course, you need to make sure you use standard 750mL bottles for the best results. You can always store larger bottles in this fridge if you simply remove a rack or two from the space. It’s very easy to fix this up as required. Overall, these two Magic Chef wine coolers are very different from each other based on how one can handle just six bottles and another can handle 28 at a time. Still, these are two units that are designed with care and will give you some good spots worth trying out when you’re looking to store wines in any space in your home. What Control Scheme Is Best For Your Wine Cooler?